Having a short nap with my backpack. 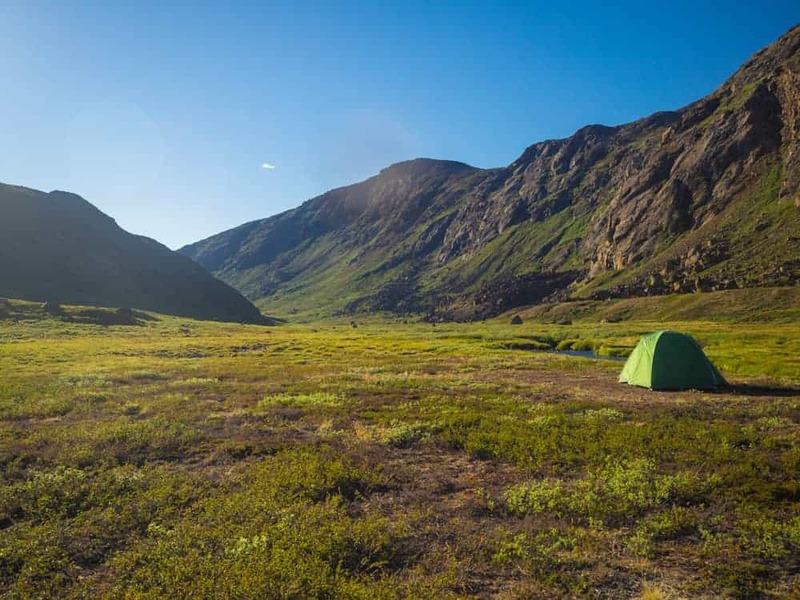 The Arctic Circle Trail in Greenland is one of the best hikes in the world. But it might not be for everyone since you have to be completely self-sufficient, you will have to carry your own food for every day on the hike, between 9 and 11 days depending on your speed and the wheater condition. 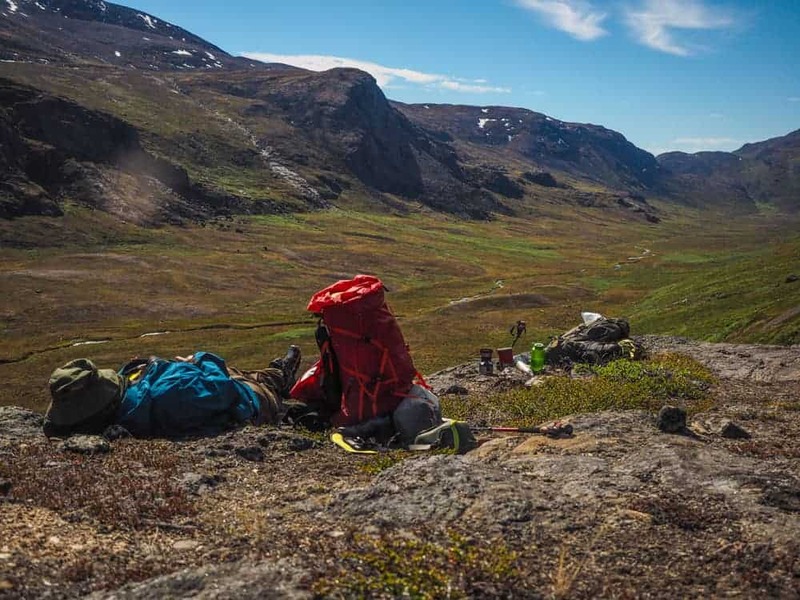 Here´s my “Arctic Circle Trail packing list,” here´s everything that was in my backpack during the nine days I used to hike the 163KM from Kangerlussuaq to Sisimut. There´is technically nowhere to get food on the way, tho you could try your fishing luck. And the only way to wash your clothes in the cold rivers and lakes, even tho it was sunny during most of my hike, so wasn’t it warm enough to try wet cloths. If you have checked my other packing lists for hiking, so will you notice I always use walking sticks. I can´t recommend that enough. My Black Diamond Tent during the hike. My Sleeping bag and mat might seem like a bit of an overkill. But the nights were chilly, and I’m very pleased I packet it with me. There´s a free cabin to stay at every night but they are often full so you should defiantly bring a tent with you. Here´s my complete Arctic Circle Packing List. Sleeping Bag: Ajungilak Kompakt Down. Parts of the Hike is very wet so I would recommend two bring two pairs of shoes, and a couple of flipflops or sandals to leet your feet to dry in in the evenings. Mosquito Hat. This is VERY important. I never experienced that amount of mosquitos anywhere else in the world, as I did during the Arctic Circle Trail Hike. Like mention in the main blog post (click here) so didn’t I see a single berry during my hike, like previous hikers a few years ago have mentioned they did. The reason might be that the hike has become very popular lately with hikers. I did meet people on the hike that had caught fresh Salamon like I was offered on day 5 (click here to read). You are supposed to buy a fishing license to be allowed to fish, but nobody I meet during the hike had bothered doing so. While there´s a supermarket in Kangerlussuaq and Sisimut, so will I highly recommend you to bring all the food you will need, with you from home. If you have forgotten something, so can you get the basic and toiletries in both places, but not much more, and there no hiking food in any of the towns for sale. For breakfast did I bring 4.5KG of Muslei with added nuts and berries and about 1 KG of milk powder. I Did bring 20 Packs of REAL Turmat; they offer a huge selection of varieties of different meals in Northern Europe. But doesn’t seem to be popular anywhere else. I also packed with me 20 packs of protein bars. I finished the hike in 9days, so I had a few spare hiking foods, and protein pars, but I did finish all my Musel and had ration the two lasts days. Obviously so is there nowhere to charge your electronics during the hike. I was pretty satisfied with what I had packet when I finished the trek; I used all of my clothes during the hike. But If I should have done anything differently so was there no need to bring a headlamp since the midnight sun, and it never gets dark during the summer months. And I should have packed with me another 500grams more of Museli for breakfast so I wouldn’t have had to ration the portions the last two days on the hike. Hello and may thanks for your informative blog. I wanted to know how easy is it to buy cooking gas in Kangerlussuaq. Is there a variety of different canister types and is it possible to buy/ rent a stove in case no gas is available for my stove.